A journey is the process of travelling from one place to another by land, air or sea. We seek holidays as an escape, voyages as an adventure and all journeys are a necessity for us to progress. As a living creature we are all on the process of life’s journey; whether this be the trips we undertake on a daily basis from A to B, to the personal change we undergo through life experience. We are all on our own individual journey; which can be in terms of our ambitions and dreams but it can also be emotional or spiritual. We may seek companions on this adventure and these may change and alter over time. Our journey may change course through events beyond our control. We are merely travellers through time. As artists, our artwork is a reflection of our creative journey. A journey is a passage or process from one stage to another; and in terms of art we achieve this through research, practice and development of our creativity from one idea to the next. Our work is a mirror of our journey. Featuring the work of both local and national artists, their interpretations of the theme span across all of these areas; utilising their own personal journeys, reflections on travelling, souvenirs and modes of transportation. Visitors to the centre can share your journey through the method of collage. These collage creations will form a unique display in the creative area of the gallery. There will also be an Artist Trading Card event alongside this exhibition on the same theme. More information about this will follow shortly. The exhibition will coincide with another an update in our Heritage area looking at Transport. This display will feature work by local photographer Norman Spilsbury, information from Manchester Museum of Transport and a display about the changes occurring to our interchange in Altrincham. 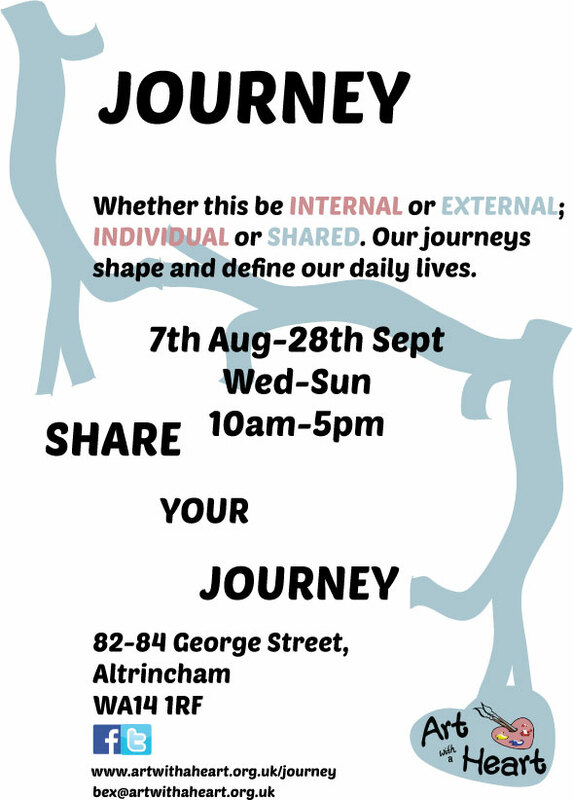 This month we are asking all visitors to create their very own artistic postcard based on the theme of Journey. This could be be based on a holiday, personal journey or a family trip. Blank postcards are available from Art with a Heart. All postcards will be added to our display wall. We want you to create a visual documentation of your ‘journey‘. Work can be created in the centre, or brought in and added to our display. We are particularly interested in collage work. Why not create a miniature scrapbook on a postcard of your holiday?